Forget Goa! Of late, it is the ‘God’s own country’ of Kerala that has become the undisputed beach haven for travellers of all make and kind, not only from India but the world over. And for this, Kerala has the gorgeous scenic beauty marked by the stunning backwaters of Alleppey (or Alappuzha) to thank for. Located half an hour from Alleppey, the Marari Sands Beach Resort by Tree Leaf Hospitality is your ultimate retreat paradise. Here, you get exclusive private access to unspoilt stretches of pristine white sand where you can relax in peace and quiet. The luxury villas offer a great indulgence in rich Kerala cuisine, Ayurvedic spa, and a host of local experiences that allow you to spend your days with locals and the fishermen, and live in perfect harmony with the life of the coast. From white breasted waterhen and jungle myna, to billed storks and Asian palm swift, Alleppey’s backwaters make for quite a lush spot for rare migratory birds. Club that with kayaking and canoeing, and the wildlife photographer in you gets the perfect opportunity. The temples of the South are fabled for their grandeur and magnificence, and the same can be found in the town of Alleppey. The place is littered with many old and traditional churches and temples that will appeal to devotional travellers of all kinds. Amongst the most famous ones that warrant a visit include Nagaraja Temple, Ambalapuzha Krishna Temple, Latin Catholic Church, St. Mary’s Church, and St. Andrew’s Florence Forance Church. Explore the history behind Christianity and Hinduism in Kerala here. 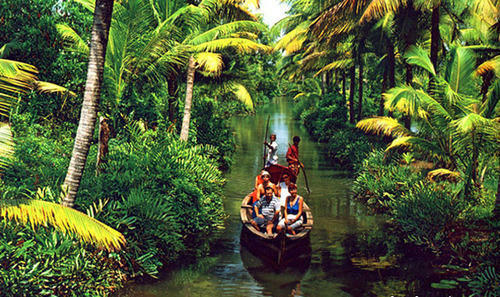 Of course, who can miss the beaches when in Alleppey? Apart from the one which is named after the town and houses a lighthouse and a 137-years old pier, the quaint little Pozhiyoram Beach is one of the best romantic spots around. Swim in its refreshing waters or enjoy a blissful candlelight meal at sunset with your significant other! For another romantic experience, you can always go on a date aboard the boathouses in the backwaters. The mouth-watering dishes and gourmet specialities of Kerala stem from its reliance on the daily catch of seafood. This often results in eclectic and authentically prepared meals that employ regional spices and herbs to bring out the surreal taste to good effect. Chettinad chicken, prawns and banana chips are not to be missed if you are a foodie traveller! This is a seasonal attraction, and a worthy one in the month of August. Boat racing is rooted deeply in the culture of Alleppey, and if you want to learn more about its history and origins, then visit the amazing practice runs held in June when you can interact with locals and participants. Who knows, maybe you will get a chance to ride the thing?